If you live in the beautiful seaside town of Greenwich, Connecticut and need an outdoor railing system, you likely want a railing that complements its natural surroundings. For your interior railings, you may be in search of a modern railing design that fits the grandeur of your home. If this description fits your architectural vision, cable railing is a perfect fit. Keuka Studios crafts cable railing systems for stairs, decks, balconies, ramps, and other indoor and outdoor applications. The unobtrusive structure of cable railing gives each system a modern, minimal appearance. Because of this design, cable railing works particularly well for oceanfront properties. The distance between each post and thin cable infills allows for near transparency when looking through the railing. For decks that overlook the water, cable railing provides a safeguard without blocking the view or the sea breeze. Need ideas for your railing project? Check out our completed projects in Greenwich, Connecticut. zigzag staircase complete with a cable railing system. To match the home’s sleek style, the homeowner chose our Ithaca Style railing with slender posts and clean lines. Altogether, the railing system and stairs create a modern and minimalist look. The backyard of this luxurious home in Old Greenwich features a pool that sits directly in front of the ocean. For this unique project, our team designed both horizontal and vertical cable railings. The project included a fence, balcony railings, stair railings, and a custom gate. Because of the unobtrusive design of our Ithaca Style railings, you can sit on the patio and see straight through the railing, across the pool, and out at the ocean beyond. We had the privilege of designing a cable railing for the “Wood and Glass House” remodel by the acclaimed Japanese architect Kengo Kuma. Coupled with our Ithaca Style cable railing, the floor-to-ceiling glass gives the home complete transparency. 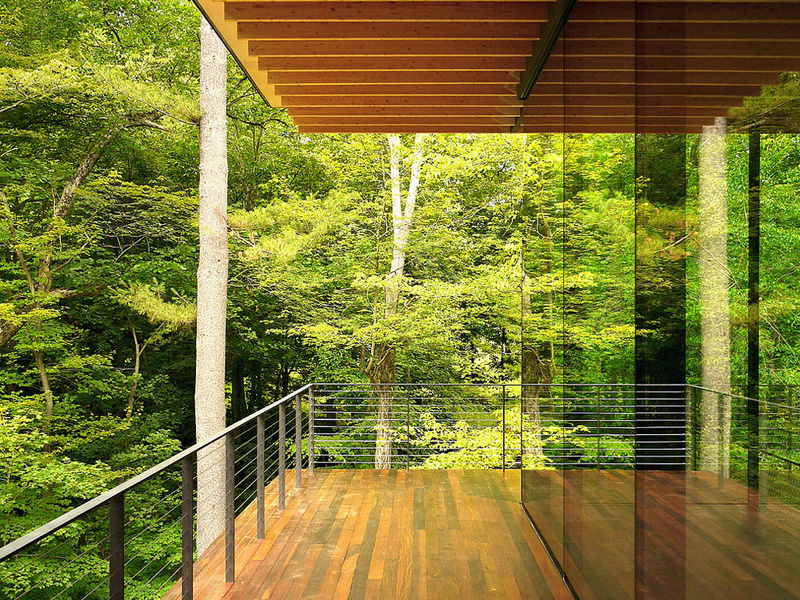 As a result, the Wood and Glass House perfectly melds its natural surroundings with modern design. 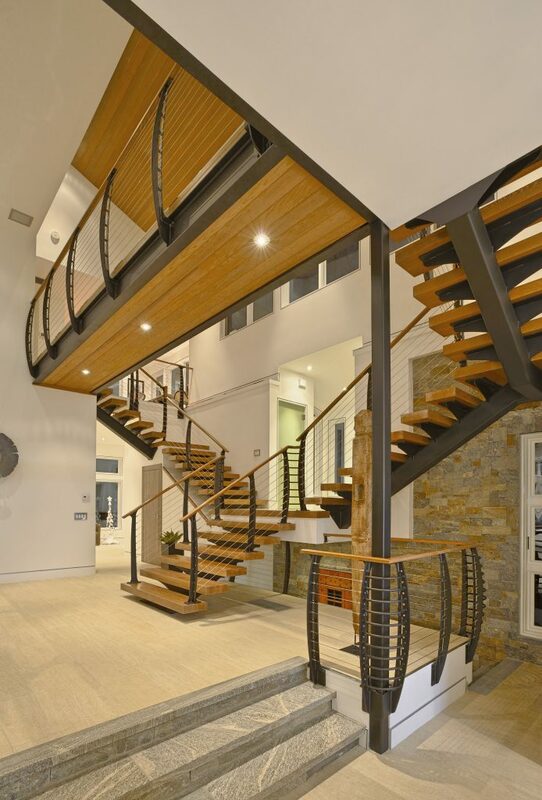 This contemporary home sits right on Candlewood Lake. When the homeowners remolded their entryway, they wanted a grand staircase that would make a statement. Keuka Studios crafted the unique mono-stringer staircase that breaks off into two sets of stairs from a central platform. In addition, our team designed and built a complete railing system using our Keuka Style posts. The railing provides a safeguard for the grand staircase as well as an upper-level catwalk. 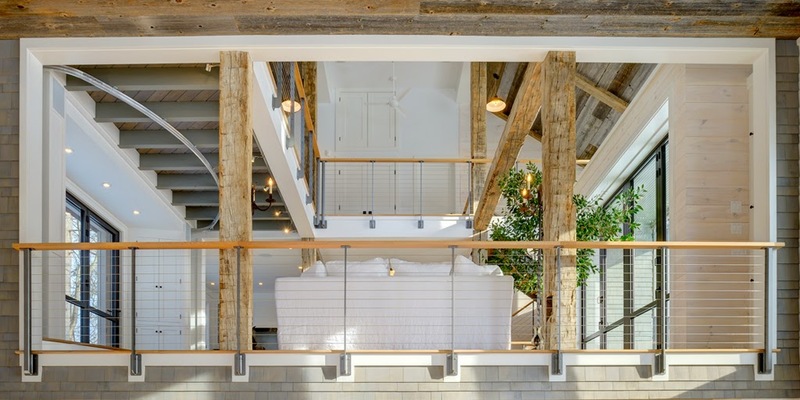 Architect James Dixon designed this modern rustic barn for luxurious entertainment. In order to create an open, modern atmosphere, the architect chose our Ithaca Style cable railing for the stairs and balconies.